During WW2 Rick's old girlfriend, enters his "Gin Joint" and tries to get his visas so she and her freedom figher husband can escape the Nazi's. Michael Curtiz (who also won the Oscar for direction). With Paul Henreid, Sydney Greenstreet, Peter Lorre, Conrad Veidt, S.Z. Sakall, and Dooley Wilson. Producer Hal Wallis (1898 - 1986) started working in 1922. His other works include: THE STORY OF LOUIS PASTEUR, JEZEBEL, KINGS ROW, BECKET, TRUE GRIT, ANNE OF THE THOUSAND DAYS, and ROOSTER COGBURN. Julius J. Epstein, Phillip G. Epstein, and Howard Koch received the Screenplay Oscar. The song: "As Time Goes By" is memorable classic. 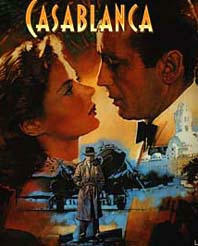 CASABLANCA is considered one of the screen's greatest romance films and could have the most quoted dialog of any film.